Rising above the core of Downtown Seattle, beautiful Queen Anne Hill overlooks Elliott Bay to the west and the Seattle skyline to the south. It offers great views of the city and that familiar landmark from the 1962 World’s Fair, the Space Needle, which stands as a dramatic backdrop alongside Mt. Rainier. 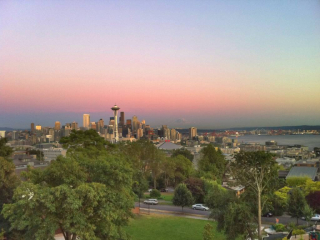 Queen Anne is rich with history, turn-of-century homes, wonderful restaurants, cafes, and shops. Developed in the early 1900s, Queen Anne is renowned for its extraordinary architecture that includes many fine examples of Queen Anne, Craftsman, Bungalows, Seattle Box, and later, Colonial styles. The highest hill in Seattle, Queen Anne rises 456 feet above Elliott Bay. Its close proximity to Downtown, the Seattle Center, where numerous sports events, concerts and theater events are held, and Seattle Pacific University, make this a highly desirable neighborhood in which to live. As of March 6th, 2013, the least expensive property for sale in Queen Anne is a 2 bedroom, 2 bath bank owned condominium priced at $84,900 while the most expensive active single family home is a 3 bedroom, 3.75 bath 2009 built Contemporary offered for $5,950,000. Looking at the last 90 days, the Median List Price in Queen Anne is $420,000 with homes selling for a Median Sale to List Price of 97.8%.